Tomorrow, all eyes will be on the Colorado GOP State Convention to see who delegates send to the national convention, which promises to be a contentious affair. And, then, there is a football team of U.S. Senate candidates to consider. But there is another election worth watching – for National Committeewoman. 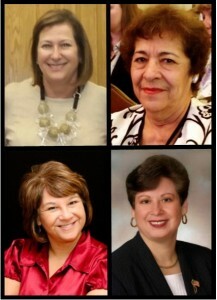 To the best of our knowledge, currently, there are four women running for the seat (in alphabetical order) – Arapahoe GOP Chair Joy Hoffman, current National Committeewoman Lily Nunez, Vera Ortegon from Pueblo, and Jefferson County Commissioner and former Assistant Minority Leader Libby Szabo. Joy Hoffman – Hoffman, a businesswoman, has been the chair of the Arapahoe GOP since 2011. She previously served as precinct committeewoman and Chair of County Chairs of the GOP. Lily Nunez – Nunez has served as National Committeewoman since 2000 and is seeking re-election. Vera Ortegon – Ortegon was former gubernatorial candidate Mike Kopp’s pick for Lieutenant Governor in 2014. She also has served as a Republican on the Pueblo City Council and was a candidate for U.S. Congress in CD3. Libby Szabo – Szabo currently is a Jefferson County Commissioner. She also has served in the State House of Representatives. While she was there, she was the Assistant Minority Leader. She also has adopted a clever campaign slogan – Status Quo? Heck no! It’s interesting to note that three out of the four running are Hispanic. So much for Republicans lacking diversity within the party. The victorious vixen’s term will begin in 2017, so this has nothing to do with this year’s presidential selection. But the National Committeewoman’s job is to be a liaison between Colorado Republicans and the Republican National Committee, so it’s a big deal.